On the centenary of the end of the First World War, Peter Jackson brings us, in high definition, the human face of the devastating conflict. They Shall Not Grow Old is a deeply moving and utterly gripping first hand account of day-to-day life in World War One. Using state of the art technology to restore original archival footage (which, of course, is now more than 100 years old) director, Peter Jackson, brings to life the people who can tell this story best - the men who were there. Jackson’s film starts with a series of surprisingly positive war-time recollections. While watching the archive footage, we hear men describe their reasons for signing up to serve their country. It is fascinating - particularly when we hear from those who were far younger than 19, the minimum age requirement. From the very beginning of They Shall Not Grow Old, we realise Jackson is not concerned with the historical significance, politics or strategies of World War One. He is far more interested in the social experience - the human experience - of this conflict. We learn about the reality of life on the front line - from the ill-fitting uniforms to the barely adequate rations of food and drink, from the uplifting camaraderie to the rigorous training. The documentary reveals how the soldiers ate, slept, formed friendships and what went on away from the trenches. Nothing, of course, could have prepared these men for what they were about to face. Their matter of fact descriptions of the most horrendous events and conditions (displayed here in a series of horrific images - the documentary is Rated 15 for good reason) is both shocking and astonishing. The First World War was a landmark moment in cinema history. It was the first time that the horrors of war could be captured on camera. Hours of incredible footage was filmed on the battlefields. We have seen many examples of this footage over the years. "We all know what First World War footage looks like,” Jackson said at the screening of his film during the BFI London Film Festival. “It's sped up, it's fast, like Charlie Chaplin, grainy, jumpy, scratchy, and it immediately blocks you from actually connecting with the events on screen." This effect is emphasised by Jackson’s decision to slow the footage down and (painstakingly) add colour. All of a sudden, these men come to life and become startlingly - and often unbearably - real. They Shall Not Grow Old reminds us again of the astonishing bravery displayed by these soldiers. It explores the devastating sacrifice and ultimate futility of war. That these men did not receive the support they deserved on their return remains an unforgivable outrage. After being approached by London’s Imperial War Museum to do something with its archive footage, Jackson was driven to make his documentary by a personal interest in the First World War. He spent months immersed in the BBC and Imperial War Museums’ archives. The director and his team then used cutting edge techniques to make the images of a hundred years ago appear as if they were shot yesterday. The transformation from black and white to colourised footage reveals never before seen details. Jackson’s aim was to give these men voices, investigate the hopes and fears of the veterans, the humility and humanity that represented a generation changed forever by a global war. They Shall Not Grow Old is an important, informative and incredibly powerful cinematic experience. A sobering and inspiring must-see documentary. 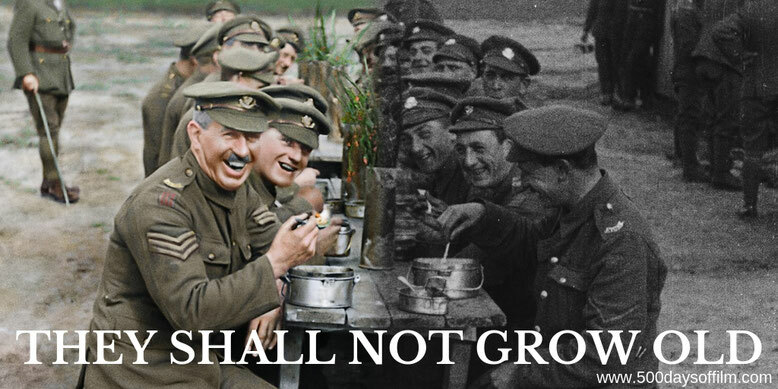 Have you seen They Shall Not Grow Old? If you have, what do you think of Peter Jackson’s documentary? Let me know in the comments section below or via Twitter. You can find me @500DaysOfFilm.